Infinity Premise Amplifiers combine a revolutionary design and unique features in the industries smallest housing. With a full line of amplifiers to accommodate any installation, precision engineering and high quality materials guarantee maximum performance. A passive data port guarantees modem service even in the event of power loss. Extreme's Blue Port & Blue Label make identification easy for the installer. One way Extreme is taking the guesswork out of installations. Smart. Now the installer can remote power from the most convenient outlet in the home. Power back through the passive modem port or through active output 1. Either way, the Infinity Premise Amplifier provides the most powering flexibility of any amplifier on the market. Easy. Mount the amplifier in the best configuration regardless of the situation. Mount horizontally, vertically, or simply snap the amplifier into the Infinity Premise Enclosure eliminating the need for screws and hardware. True Flex housing is the most versatile housing ever built. Enjoy. Extreme has delivered the smallest, most compact amplifier on the market. Small and compact means less inventory space, smaller enclosures, and increased installation flexibility. Small footprint. Big performance. Smaller is better. Guaranteed to be the easiest install a technician has to perform. No matter what is coming down the drop, the amplifier will deliver the same dB at each port in both the forward and reverse. No calculations, no mess, no mistakes. Simple. Dual LED No matter which way you mount the Infinity Premise Amplifier, a status LED is always visible. Yet another way Extreme makes the installer's job easier. Brilliant. The IPA1008DL Series Data Plus amplifier, provides the same feature set at the traditional "D" series with the addition of a local power port for even greater powering options. *Also available with data stabilization option, Model IPA2008DSL-RSVF. *Also available with data stabilization option, Model IPA2004DSL-RSVF. The IPA2008DL2-RSVF is a unity gain Data Plus amplifier with MoCA, DataComm, CrossTalk . *Also available with data stabilization option, Model IPA2008DSL2-RSVF. 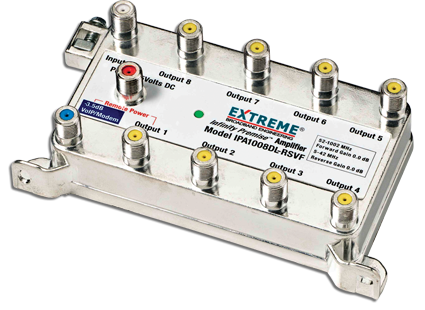 Extreme Broadband Engineering has a complete line of digital RF Amplifiers and amplifier modules for increased installation flexibility and improved reliability. Engineered to the highest design specifications and manufacturing quality, every amplifier is hand tested before it leaves the factory. 100% quality control ensures a reliable, premium amplifier. Reverse Amplifiers add reverse gain to any installation. Extreme Broadband Engineering offers stand alone reverse amplifiers and well as a reverse amplifier module allowing for a "jumperless" interface, reducing connecting and improving reliability. The IPARM is a 1-Output 10dB reverse gain amplifier module allowing a direct connection to existing amplifiers utilizing the patented FIC Port. Uniquely designed to pass power, the IPARM can share one power supply with the IPA1001 and does not need to be powered with an additional power supply. The IPRA1001 is a 1-output 10dB reverse gain amplifier. By integrating the MoCA POE Filter into an amplifier, you can reduce installation components and additional points of failure. With a variety of outputs and gain options, Extreme Broadband's line of MoCA Amplifiers provide flexibility when performing MoCA installations. Designed to the highest technical specifications as the traditional Extreme Broadband amplifier line, the MoCA amplifier is another option for MoCA installations. Please contact Extreme Broadband Engineering for additional information.